Evan as an adult, my tastes are still evolving and maturing. As I try to move toward healthier eating, I’m adding new foods to my ”YUM!” list. Like these grilled spinach-stuffed tomatoes. Ain’t no way my younger self would have eaten those. Yeah, I used to hate cilantro. Fortunately for me, I now love cilantro. I have no idea how that transition happened but I’m so glad it did. A whole new world of food is now opened up for me! Somewhere along my horizon-broadening food journey, I discovered and fell in love with avocado. Unfortunately, I’m now allergic to it. But if you’re not–and I hope you’re not; it’s soooo good for you– then you need to make sure you include both the avocado and the cilantro in this dish. (Honestly, the tomato was just kind of meh. You can do without it. But don’t skip the onion). 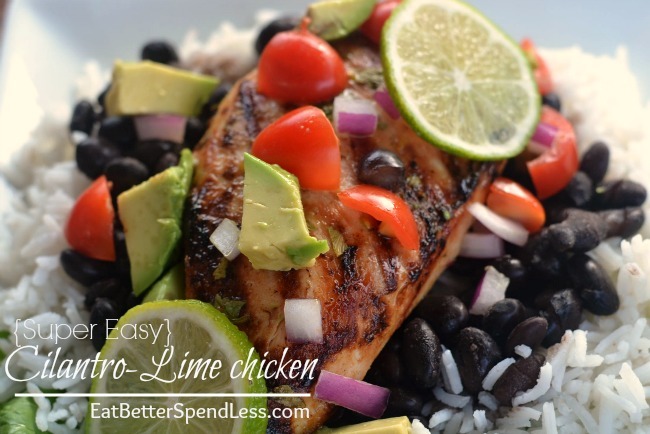 My whole family loved this Cilantro-Lime Chicken. I loved how easy it was and how delicious and healthy it is. It’s going on our list of family-favorites . Sliced lime (optional) Do not use the lime from the marinade. In a sealable plastic bag or covered casserole dish, mix all ingredients except the chicken and sliced lime. Add chicken and coat well. If using the sliced lime, lay it on top of the chicken. Refrigerate for at least an hour or several hours. Remove from marinade and discard leftover marinade. Grill, or bake on 375° until done; about 20 minutes. 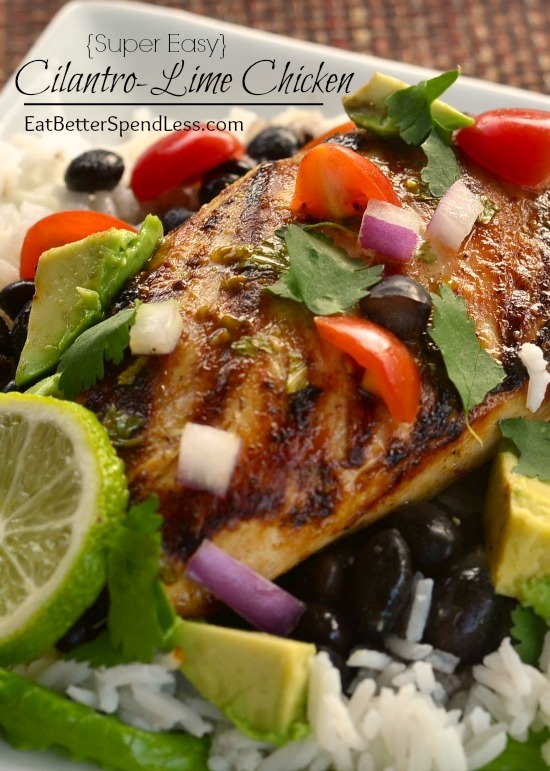 Place a serving of cooked rice, then black beans on each plate. Top rice and beans with a portion of chicken. Top chicken with garnishes of choice. Of course, You can get the chicken marinating in the morning. You can also get all of the toppings chopped and keep them in the fridge until dinner time. Cook the rice and beans ahead and just reheat when ready for them. I go one step further and cook large batches of rice and black beans (separately) and freeze in meal size portions. So, for this meal, I would take out a bag of each in the morning and just reheat them at dinner time. This is a great meal to “cook when you feel like it”. You can get most of it done in the morning, while you still have some energy! Yum! This looks amazing! I’ve been looking for cilantro chicken recipes for summer. Thanks! I hope you love it! If you’re not already, you might want to get on my mailing list. Next week I’m sending out my recipe for pineapple salsa. I finally tried making it and it was delicious! I came over this morning on the MOM 2 MOM Monday Link up. Glad to find your site. We eat a lot of chicken and fish at our house and I am always looking for creative ways to make chicken. This looks so tasty! This sounds amazing! Stopping by from Mom 2 Mom Monday.